Fresh mangoes are the key to the burst of flavor in these cupcakes. 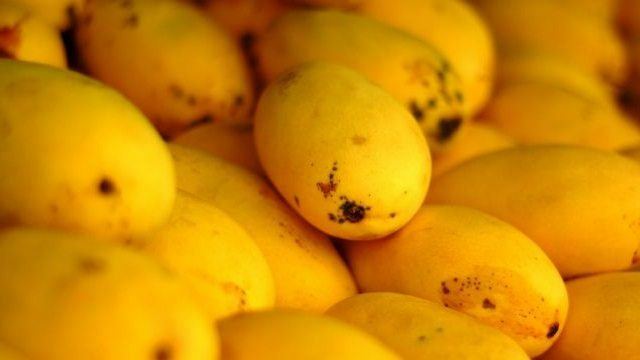 Take advantage of the fresh mangoes available! It's the key to these fresh-tasting cupcakes because you get a burst of sweet mango flavor from every bite of one of these cupcakes. Preheat oven to 350 degrees Fahrenheit. Prepare cupcake trays and line with cupcake liners. Make homemade buttermilk by combining fresh milk with vinegar. Allow mixture to sit for 5 minutes before using. Combine flour, cornstarch, baking powder, and salt in a large bowl. Sift using a strainer to break up lumps. Using either a whisk or with an electric mixer in another large bowl, combine and beat eggs together with buttermilk, oil, vanilla extract, and chopped mangoes. Add sugar to wet ingredients and mix until homogenous. Slowly add dry ingredients to the wet, making sure to mix slowly to combine. Do not overmix. Using an ice cream scoop, slowly scoop ingredients inside cupcake tray, only filling up the trays until 2/3's full. Bake for 19 to 24 minutes or until a toothpick inserted in the center comes out clean. Once done, remove cupcakes from oven and allow to cool thoroughly before frosting. Make mango sauce by heating up mango puree in a saucepan on the stove with sugar, mixing constantly until puree is thickened. Set aside and cool completely. Make mango buttercream frosting: beat remaining butter on Medium speed for 3 minutes using a mixer. Add half of the cooled and thickened mango puree and vanilla extract. Add powdered sugar 1/4 cup at a time until ideal consistency is achieved. (It is possible to thin out the frosting by adding milk, and to thicken the frosting by adding more powdered sugar until desired consistency is achieved.) Color the frosting yellow by adding 1 drop yellow food coloring. Frost cupcakes once entirely cool. Top with extra chopped mangoes if desired, and enjoy.